And changes in Google mean changes to rankings, right? 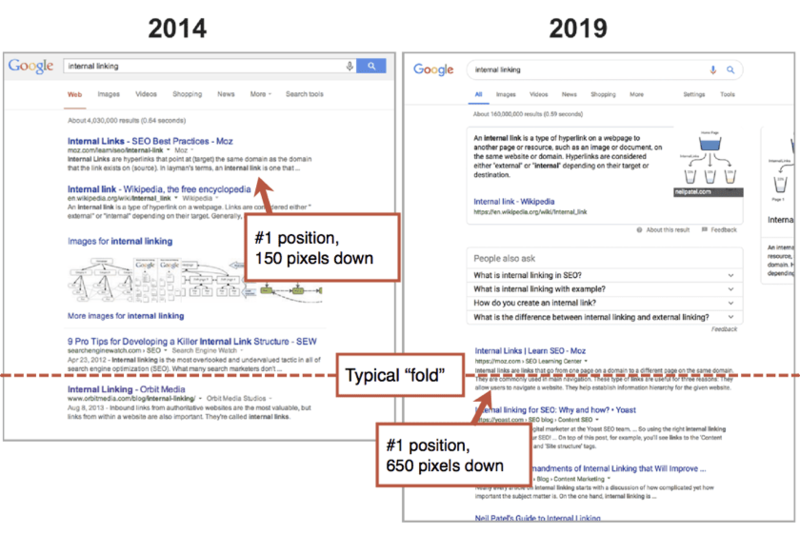 But what if the biggest changes in Google have nothing to do with rankings? Yes, Google is constantly changing. And yes the changes affect your traffic. But no, the biggest SEO trends don’t affect your rankings. They affect your click through rates. There’s a big difference. 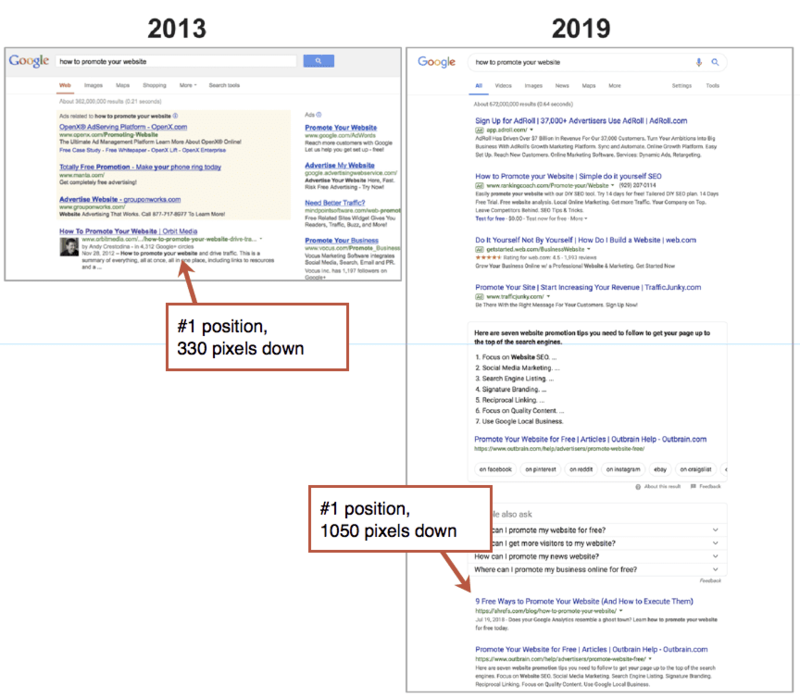 Five short years ago, the typical SERP (search engine results page) looked much different. I have an archive of old screenshots of SERPs, so this is going to be fun. Just glancing at these make the big SEO trends obvious. In 2014, if you searched for “lead generation websites” this is what you found. Feeling nostalgic? There’s the old Google logo. But what else is different about this page? The little icon next to each ad was bright yellow. There was even a line that separated the ads from the organic rankings. And there were all those ads on the right rail. 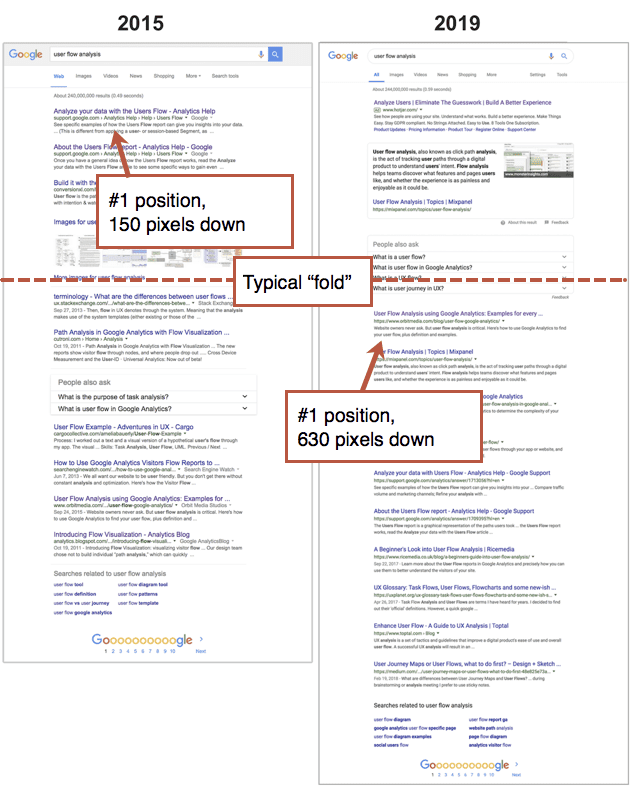 Assuming the average fold for desktop users is at 700 pixels, three organic listings are visible without scrolling. That puts me 800 pixels down the page. We’ll come back to this. Now let’s look at that same search today, in 2019. There are four ads visible here, not 12. That’s fewer, right? Not exactly, if you count the sitelinks under the ads, there are 11 links. So the number of links to advertisers is still high. And the ad icon is much less prominent. It blends in. The ads look more like organic listings, more native. One of the advertisers has stars. It’s big and it’s at the top. It combines the text from one page and the image from another. It gives enough value that the searcher may be satisfied. No need to click. Definitely not above the fold. That’s two spots lower. Not a big change. But the actual position? It’s 3000+ pixels farther down the page. The ranking changed a little (from #4 to #6) but the placement changed a lot. The listing is 800 pixels deep versus 3900 pixels deep. Surprised at how little the rankings changed over five years? I am not. In my experience, pages that rank well tend to continue to rank well over long periods of time. After five years, our page still ranks well. 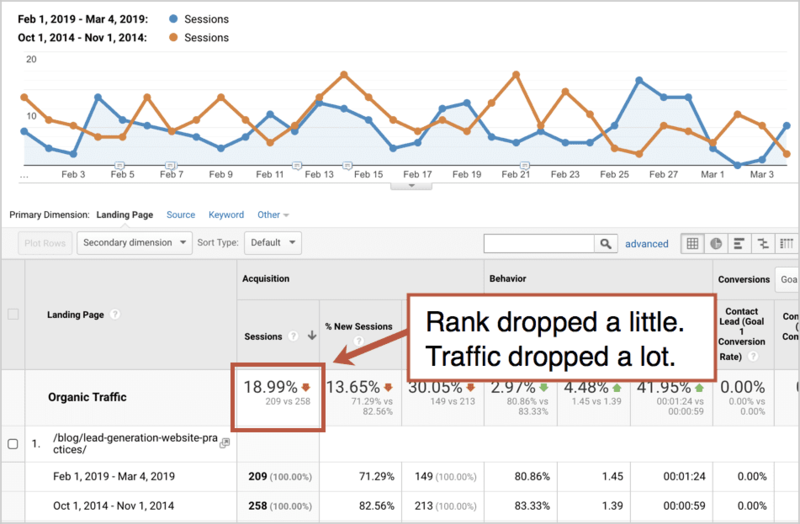 What affects the rate at which rankings change? The durability of a page’s ranking depends on the rate at which new content comes out on that topic. Changes to the ranking algorithm are real, but the much bigger SEO trends are the “SERP features,” such as featured snippets, maps and videos. There’s just a lot more stuff showing up in search results these days. Here is a list of SERP features, things you see within search results every day. You can see when they first appeared and the likelihood that they appear, in 2019, according to MozCast. Note: Mozcast is constantly updated. The chart reflects the percentages when the article was written. High ranking pages don’t rank as high as the used to. They are pushed down by SERP features. In this case, it’s ads, featured snippets and related questions. This one is fun because back in 2013, the ads still had a color background, clearly setting them apart. This was also the end of the Google Authorship era when Google shows the faces of content creators within search results. This program was canceled, presumably because it increased clicks to websites and reduced clicks on ads. 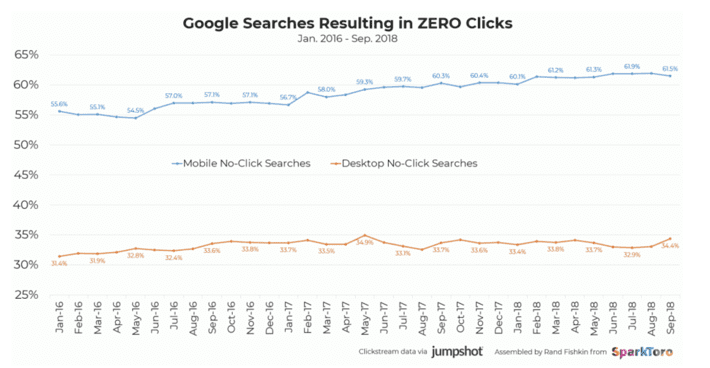 61% of desktop searches lead to SERPs that don’t get clicked (up 6% over the last 2.5 years) and a third of mobile searches are no-click (up 3%). There are 5.6 billion Google searches per day, that means roughly 250 million fewer visits to websites each day. So this is the mega-trend in SEO: more features on search results pages and therefore a lower click through rate to websites. Even if your rankings don’t change, you will generally have a lower click through rate over time. Here’s the traffic before and after for the first example above. What to do about rising SERP features and falling click through rates? Target phrases with fewer SERP features. These are often longer phrases with lower commercial-intent. Fight for featured snippets. Here’s a guide. Use Semantic SEO. Here’s a guide. Grow your email list. The better your list, the less you rely on digital giants. Write for other websites. It won’t increase your traffic, but guest posting on authoritative websites can do wonders for the visibility of your content. Double down on keyphrase-focused content. There are still millions of great keyphrase opportunities. You can target any of them with just a day of research and writing. “I would also think about ways to increase retention once somebody does land on your site. Think about the journey of the searcher. What is the next piece of information they may want to know after searching a particular query? Include that in your content! This way you are helping to prevent them from going back to Google because they can stay on your site to find more of what they need. For example, I had a former client do that in this article. People land on it looking for health business names, and then we provided them with links to tale their next most logical step – register domain names and claim social profiles! Here are a few more major SEO trends, starting with the big one we just covered. 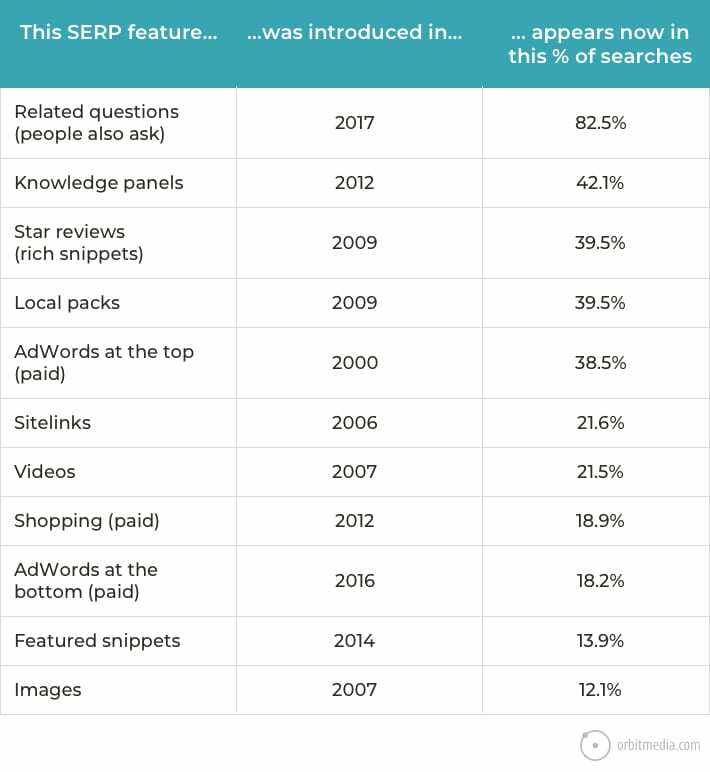 Increase in search engine results page (SERP) features, including featured snippets and related question boxes, leading to lower click through rates (CTR) and more “no-click” searches. Increase in voice search for local businesses. According to a BrightLocal study, 58% of consumers have used voice search to find local businesses in the past year. Increase in mobile search. According to Statista, 60% of Google searches are done on mobile. 5 years ago, it was at 34%. It’s almost doubled in five years. We hear this a lot. 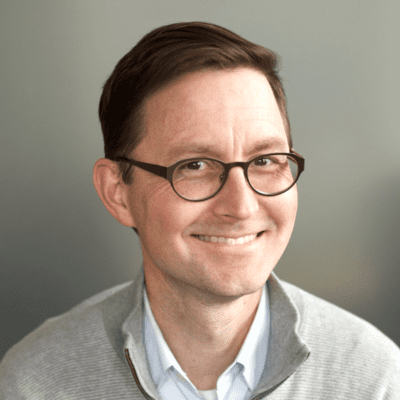 I often respond with a simple question “what kind of SEO maintenance do you have in mind?” Typically, after a short silence, they explain they want to maintain their rankings for a few specific phrases. Oh my. There’s so much more to search than rankings. Thanks for this, Andy. I’ll be using it in an upcoming presentation. I think an emphasis on mapping your content to the customer journey is becoming increasingly important. Every opportunity counts. And guest blogging and not relying entirely on Google has become a must. Thanks, Greg! It was fun to go back into the archive of old screenshots and show how things have changed. Yes, this one might be useful for client education. There’s more to SEO than rankings! Auditing your content and then mapping what you have to your buyer/customer journey is such an important part of this process! Every interaction is a chance for your brand to resonate—especially with a lower overall click-through rate. Great article! SEO is changing which is one of the reasons why it so exciting and creates new opportunities! Andy, you never disappoint. Great insights on a most important topic. So, you won’t get ahead treading water. Thank you so much for these insights. After a recent web rewrite, both our external search and site search results have greatly improved. Phase II will involve tweaking the content based on voice search trends and how it has changed how people search, whether it’s keyed in or via voice. For all of our efforts, helping our members find the info. they need is the goal. This info. and the stats to back it up will be very helpful as I write a training guide for our team! Thanks for the great info! Since Google is constantly changing its algorithm, keeping up isn’t always easy. In this digital world, SEO takes an important place for each and every business. Thanks for sharing this detailed new trends of SEO. This will be very useful to make new strategies of SEO in business. 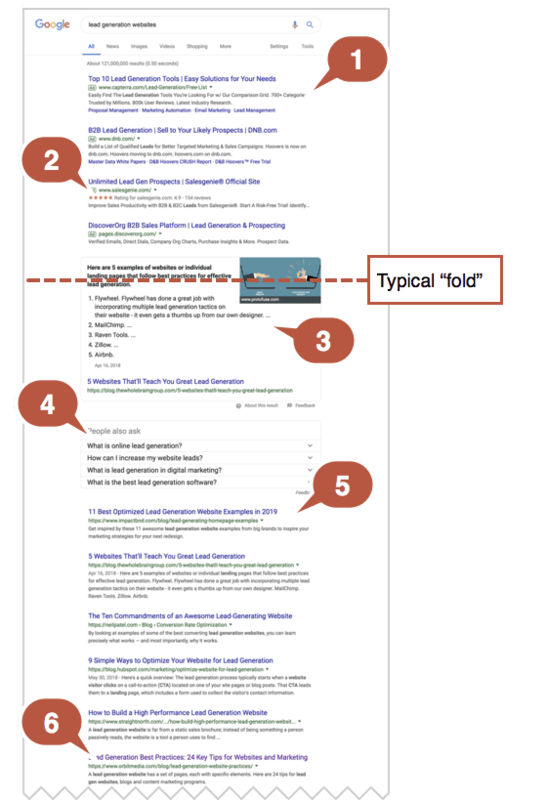 “It combines the text from one page….and the image from another.” Interesting tid-bit on featured snippets. 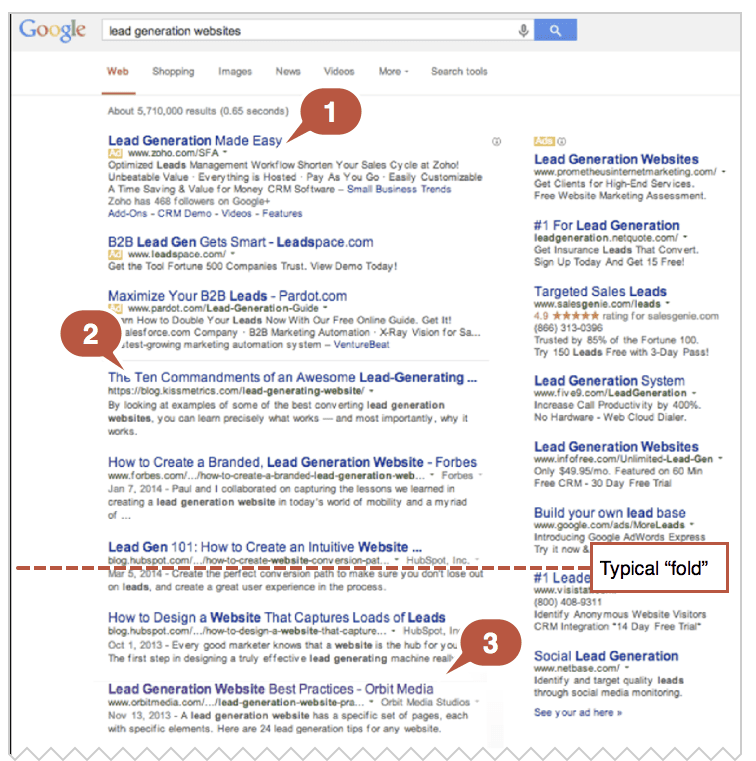 This image in your illustration Andy is from my blog I wrote on lead gen. Didn’t know the giant featured snippet would combine text/image from difference sources. Not sure how I feel about that. 🙂 Overall, this is so good sir. Love all the visuals and appreciate the time you put into this piece!